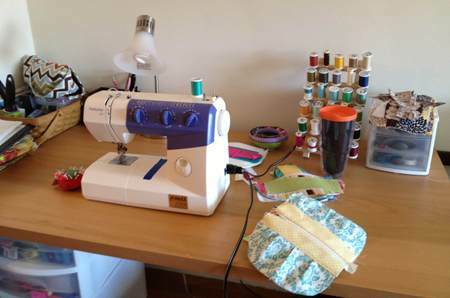 "Here is a shot of my sewing space in my apartment. It's where I cut the fabric, pin the pieces together and sew all of my handbags and accessories. I set up my ironing board when needed and am able to see the TV while doing it all. It's the perfect set up for me until I can have an actual sewing room. Go to www.abigailleigh.etsy.com to see my handmade handbags and accessories." To check out past articles featuring the workspaces of our group members visit: http://bostonhandmade.blogspot.com/search/label/workspace. don't be in to much of a hurry to get your sewing room. For all of my familys growing up time I just had to squeeze into any available corner. Now they have left home and I have a roomy sewing space, my productivity has dropped dramatically.